Abidjan, Côte d'Ivoire, Mar 6 2017 (IPS) - International Women’s Day (IWD) is an important opportunity to celebrate the achievements of women and to be bold in promoting gender parity. Our world would be a much better place with gender parity in all spheres. We need more women as CEOs, in parliaments, as engineers, computer scientists, astronauts, and as heads of state, traditional areas dominated by men. The Global Gender Gap Report 2016 by the World Economic Forum estimated that sub-Saharan Africa will achieve gender parity in 79 years. We cannot afford to wait so long. Africa would have lost all the benefits of developing faster with several generations of women and girls. It’s time to close the gender gap in Africa with bold actions. Women can play a huge role in societies undergoing conflicts, as peace makers, reconciling communities, building peace and building societal resilience. In Sudan, where conflicts abound, the African Development Bank is providing support of close to $5 million for women to help in conflict resolution. We are doing more: we are taking decisive action to level the playing field for women’s access to finance. Women dominate the small and medium scale enterprises across Africa. They dominate farming but lack access to secure land and property rights. Yet they pay back loans better than men. When Africa gets the issues of women right, it will finally get agriculture right. 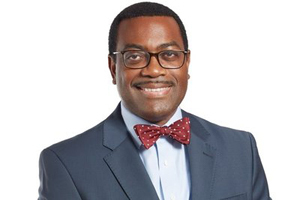 The African Development Bank has launched the Affirmative Finance Action for Women (AFAWA), a bold effort to help leverage $3 billion for women owned businesses, including women farmers. At the Bank, we are working hard internally to close the gender gap. Of the recent senior management appointments I have made to run the business of the Bank in our 5 regional offices, 50% are women. The recruitment of young professionals within the Bank is also more gender balanced, and the 2015 cohort shows that 60% are female. Another positive move within the Bank is the introduction of a women’s mentorship pilot “Crossing Thresholds,” which provides women with an opportunity to develop their career in a structured and supportive environment. We are doing better in mainstreaming gender into our Bank operations. When comparing the years 2012-2013 to 2014-2015, the Bank has improved its performance in gender parity in job creation and gender-specific training for jobs. Gender specific impacts of a Bank’s operations by sector are becoming more equal between females and males, and is even higher at 60% in favor of women in education. The Bank is fully committed to speeding up gender parity within the institution and across its Regional Member Countries. To help with this, we have created a new Department of Gender, Women and Civil Society within the Bank. We will take a page from the International Women’s Day 2017 campaign and commit to being “bold for change”. We will be bold in our support for women and inclusiveness of women and girls. Africa’s economic growth will be faster and development outcomes better when we ensure gender equality. After all, no bird can fly with just one wing. Africa needs to fly with two wings in balance. And that is exactly what gender parity does. So let’s get on it much faster.